The older sister wrote to me wondering if the two of them could regain some of the closeness they enjoyed when they were younger. These two sisters have a lot going on between their charts and a lot of parallels too. I’m going to start with the parallels and then move to the synastry.For starters, they both have Scorpio Rising, so I looked to see what Mars and Pluto were doing in the individual charts and found several interesting things. They both have Pluto square Mercury, strong minded types here! And they both have Mars in aspect to Pluto with the older sister’s Pluto sextile her Mars/Sun conjunction in Sagittarius, and the younger one’s Mars semi-sextile Pluto. What this suggests is if they do have differences, and they are both sure they are correct, they could spend YEARS arguing the same points! Oh yes, their Mercury’s are in opposition by Sign – Capricorn vs. Cancer. They both have their Suns in aspect to Pluto too. The younger sister is a Gemini Sun trine Pluto in Libra and the older has Sagittarius Sun sextile Pluto in Libra. One last aspect they both share is Mars/Sun, one square and the other conjunct. I see both of these women as feisty, very strong minded and tenacious as all get out and I’m betting they have a healthy respect for each other too. It’s a curious thing when Scorpio/Pluto types meet, circle around one another and decide if they are going to fight to the death or respect each other’s differences and take on the world as a team. To get an idea about the case here I looked at the synastry between their charts. We find their Suns complement each other and the ruler of the older sister’s Sun, Jupiter, is sextile Mercury, Gemini’s ruler, in her Gemini sister’s chart – a very positive exchange. The opposition between the Suns affirms the sense of being a team too. They have three sets of intra-aspects (same planets/both charts) drawing them together including either Pluto or Mars. A contentious set of Mercury square Pluto’s, an invigorating one with Mars aspecting Mercury and one to sustain their bond with Saturn aspecting Mars. Other assorted synastry aspects include the younger sibling’s Mars/Saturn conjunction setting on her older sis’s Moon in Virgo for durability, the younger sib’s Uranus conjunct her sister’s Ascendant and sextile her Moon to give some zip, and said Virgo Moon square the Gemini sister’s Sun for some sisterly nagging. And last but least is the Neptune/Sun/Mars grouping in Sagittarius – gentle, forgiving, psychic and subtle. The feeling I got working with these charts is this: no matter how much time or distance comes between these two, if need arises they will come and stand by the other. I have noticed my own relationships with my sisters reviving now as we grow older and children are grown and have lives of their own. All relationships have natural cycles of closeness and distance but these two sisters are so nestled in each other’s hearts in the long run neither time nor distance will be an issue. 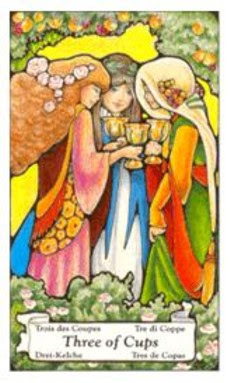 This is the Three of Cups from the Hanson Roberts tarot deck and is a lovely card for the expression of warmth and friendship.